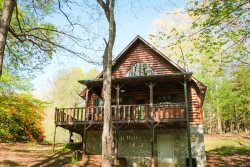 North Georgia Local Area Guide - The Mountain town of Blue Ridge is your base camp for outdoor adventure in the North Georgia Mountains! Everyone has to go shopping on vacation! Map of Downtown Blue Ridge - Shops, Businesses and Dining. Explore Blue Ridge by renting bike, canoes, boats & other personal water crafts. North Georgia Fishing & Hunting Guides and Important Information: TVA Dam Release, Licences, & Recommendations. A List of local golf coures in the Blue Ridge Mountains. Helps you stay in fit while on vacations. General information on Hiking Trails and Waterfalls in the Blue Ridge and surrounding area. List of National & State Parks. Source Fannin County Chamber of Commerce. Massages, Facials, Manicure - Pedicure, Hair and In Cabin Services. Take a beautiful all day trip in your car or on a motorcycle. A list of Unique & Special places in North Georgia, East Tennessee, and western North Carolina. North Georgia, Eastern Tennessee & Western North Carolina Whitewater Outfitters and Outdoor Centers. A list of Wineries & Vineyards. All Inclusive Motorcycle Vacations Tours in the Mountains of: North Carolina, Tennessee and North Georgia. A list of Wedding Venues, Photographers and Bakeries.